Each program is designed to get students excited about reading and writing, while also teaching them about the rich and unique culture that lives in the heart of New Orleans! If you’re interested in a visit, see our program descriptions below & email us for pricing info. After enjoying a reading of The Little Who Dat, Who Didn’t by author Aleander McConduit, students will learn about the history of the New Orleans Saints and why they play such a special role in the hearts of New Orleanians. McConduit will discuss words and phrases unique to New Orleans, how he became an author and the importance of ideas, reading and writing in everyday life. Students get the opportunity to become apart of the story by joining in the Saints’ famous cheer, “Who Dat Say Dey Gonna Beat Dem Saints! ?”, each time the story calls for it. McConduit reads aloud from his musical picture book, Thorn in My Horn while kids are dazzled with illustrations depicting real places in New Orleans. Students will also get to hear McConduit “attempt” to play his horn, as they join in each time the story calls for it! After the story ends, in true New Orleans fashion, McConduit leads a Second Line around the room to let everyone know that the show is over! Alex McConduit reads his book, Snoballs For All, while students chant the book’s title each time the story calls for it. While enjoying the story, each student receives one free snoball from a local vendor. After the reading, students learn about rhyming words and poetry. Alex discusses the history of Snoballs in New Orleans and why they are unique to Southeast Louisiana. At the end of each session, McConduit talks about how he became an author and stresses the importance of ideas, reading and writing in everyday life. W.R.I.T.E. is a youth writing & publishing program designed to take students from all over the world, and transform them into published authors! To learn more about our full programming, click here. W.R.I.T.E. also offers custom writing workshops that give students of all ages the opportunity to exercise their creativity, while allowing educators to address their students’ goals. All students who participate in our programs get the opportunity to meet and work with published authors and professional writers from all walks of life. 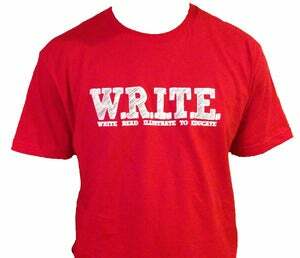 To learn how we can work together, please email us at WRITEtoEDUCATE@gmail.com.